Iceland's black beaches are unlike anything we've ever seen in this world. Especially at dusk, when the ambient light fades and your eyes start playing tricks on you. The black volcanic sand suddenly looks like crushed chocolate cookies, and the towering columns loom eerily above you, the world loses all color and starts to feel like it only exists in shades of black, gray, and white. Vik, an intensely beautiful black volcanic beach at the southern tip of Iceland, is one of our favorite places we've been, and we can still hear the black stones turning beneath our boots and feel the salty, damp wind rushing along the cliffs. Working with a shortened daylight timeframe (because the sun sets so early in the winter, with full darkness as early as 3pm) was a challenge, but the intensely moody resulting images were absolutely worth the extra work. Photographing a wedding in Iceland is high on our bucket list, but bridal portraits were certainly a wonderful experience! 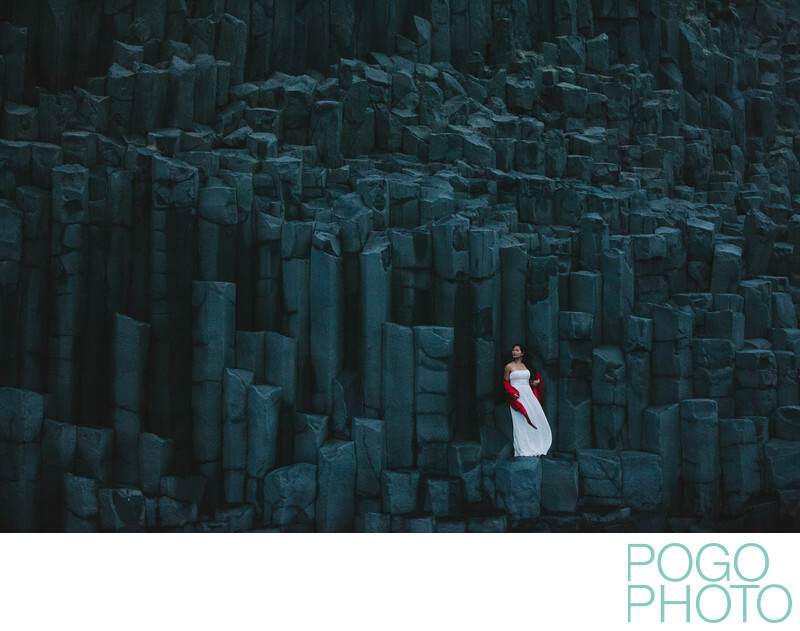 We love the isolation of this bridal figure standing out against the dark stones, with the sharp pop of red making this image less monochromatic. The sense of place is strong, and the scale of the cliffs above the figure seems immense (because it was). Iceland is a host unto itself, an incredible place we'll never forget and will return to often. The next time we return we plan to spend even more time exploring this unique island; even within only a couple of hours of Vik there are crashing waterfalls, icy beaches, towering cliffs, volcanic pools, and wild shaggy horses, just to name a few eye popping sights. 1/200; f/2.8; ISO 6400; 70.0 mm.